Shawn Martinbrough has illustrated comics for DC Comics, Vertigo, and Marvel Comics, ranging from Batman, Superman, and X-Men, to King James, based on superstar athlete Lebron James. 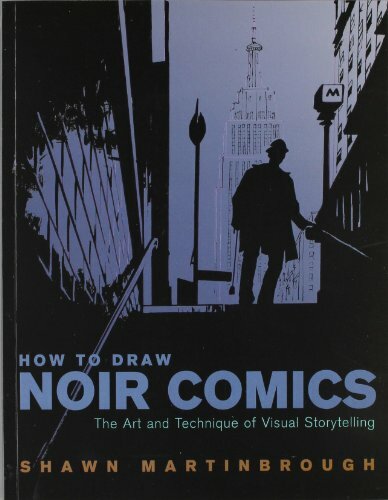 He's an accomplished artist and it's great he shares his tips on drawing noir comics with this book. Everything in the book is explained simply and clearly with lots of personal examples. He tries to address the many approaches to creating noir comics and does them well. For example when explaining the tools he used, he would talk on the type of ink to buy (fade and erase-proof), how to maintain them and choosing the right tools for the job. The main bulk of the book deals with comic creation specific to noir style. He explains the ways to create mood, lighting and texture to aid the story. And also touches the comic creation part like paneling, pacing, creating drama, choosing backgrounds, using references and more. All the examples included are well caption to emphasis the techniques reviewed. At the end of the book is a 16-page noir style graphic novel to show readers the finished product. This book is a great introduction to noir comics and serves as a great reference. You can view more of Shawn Martinbrough's work at Verge Entertainment, which is a company he founded with his partners.